The Ashton Griffin/Haseeb Qureshi prop bet story has been making its rounds throughout the poker media for the last week or so. The short version of the story is that these two high-stakes poker players made a six-figure prop bet on whether or not Ashton could run 70 miles in 24 hours, risking not only Ashton's physical health but also their friendship. Haseeb's firsthand account of his side of the bet and his emotional struggle with it, in case anyone has somehow not read it yet, is a fascinating and well-written story (Part 1, Part 2). I don't have any meaningful reactions to the actual events of this story that haven't already been expressed by plenty of others already. Among those who discussed the story, I thought crAAKKer and Bellatrix did a great job, and I generally share their views. The story itself is perhaps less interesting than the poker community's fascination with it. Perhaps it was a slow news week, but many bloggers and podcasters seemed eager to draw conclusions from this story about the poker world as a whole, including an entire article from PokerNews about whether or not crazy prop bets like these are good for poker. Something that I've come to think about is that perhaps there's something about the world of poker players that's fundamentally unhealthy. This generation of online poker players and its culture has existed for less than ten years, yet I've always had some assumption lodged deep in my psyche that if I'm not finding happiness through poker that it's just something wrong with me. And yet, there are so many people at every level of poker who are so deeply unhappy. It leaves me wondering. Did I miss the part of this story that was about poker? The Griffin/Qureshi story does not involve poker at all. Sure, Griffin and Qureshi are both poker players. But it seems they are also, to use a phrase which gives them the benefit of the doubt, active high-stakes proposition bettors. It's pretty clear that Haseeb's intent in the above quote is that there's something about the world of crazy prop bets or the overall baller lifestyle that's fundamentally unhealthy. But this world is not fundamentally related to poker. Poker is a competitive strategy game, and many of its players enjoy it solely on that basis. They make rational investment decisions with respect to their poker career, and the financial risk associated with the random elements of a poker game is merely an unavoidable cost of playing. These players will never play casino games, bet sports, or make impulsive prop bets. They are not "gamblers" in any meaningful sense of the word; they would be much better described as long-term investors. I would suggest that the Griffin/Qureshi story is a gambling story and NOT a poker story. With all due respect to the personal experience Haseeb was willing to share, the conclusions he has drawn in the quote above are not conclusions about the world of poker players. They are conclusions about the tiny world of gamblers who happen to have made it to the top of the world of poker players. Accordingly, I don't see this story as having any sort of implications for the poker community. I don't see why it should be either good or bad for poker. And, beyond the novelty value of it being a story about two poker players, I don't see why it should be carrying nearly as much content in poker-related publications as it has been. Is prop betting part of poker culture? I admit that, holed up in my ivory tower, I am likely quite out of touch with the "real-world" poker culture, centered upon the fascinating antics of our most successful players, and I would not be so silly as to suggest that the culture of a particular game is confined entirely to the game itself. If poker players as a group are actually characterized by not only playing poker, but also by making crazy prop bets, then indeed that is part of the poker culture. 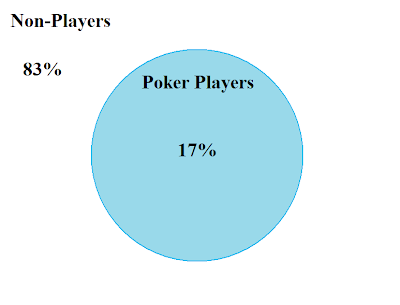 However, I would dispute the idea that prop bets are indeed characteristic of poker players. Rather, they are characteristic of a certain subgroup of poker players: gamblers who play poker. And it just so happens that the highest-stakes, highest-profile poker players in our world are probably especially likely to be gamblers. I can think of three reasons why. We'll keep the math light today, and we'll make up most of the numbers, just for the sake of illustration. Let's separate society into those who like to gamble and those who do not. 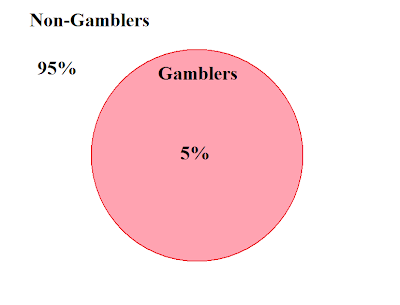 Pulling a number out of thin air, let's say that 5% of society enjoys gambling, in the sense of perhaps house-edge casino games or of unique wagers on uncertain-probability sporting events/prop bets (but NOT "gambling" merely in the sense of playing competitive strategy games for money, which is distinctly different from each of these). Now let's separate society into those who like to play poker and those who do not. Using the PPA's estimate of 55 million American poker players of various levels, we might guess that around 17% of society likes to play poker. Some portion of this 17% likes poker because it's a competitive strategy game, some portion likes poker because it's a fun way to gamble, and some portion likes it for a combination of those reasons. Unlike most other competitive strategy games, poker is very popular to play for money at all levels of stakes. Therefore, if someone who is predisposed towards enjoying gambling is going to pick a strategy game to play, they are more likely to choose the one where they will easily find millions of opponents who are willing to play it for their desired level of stakes. Much of society perceives poker as a gambling activity. Regardless of whether or not this is meaningful or accurate, this should compel people who like gambling to try poker. Casinos strengthen this perception by offering poker alongside their degenerate house-edge games. Gamblers who frequent casinos are likely to try poker at some point. 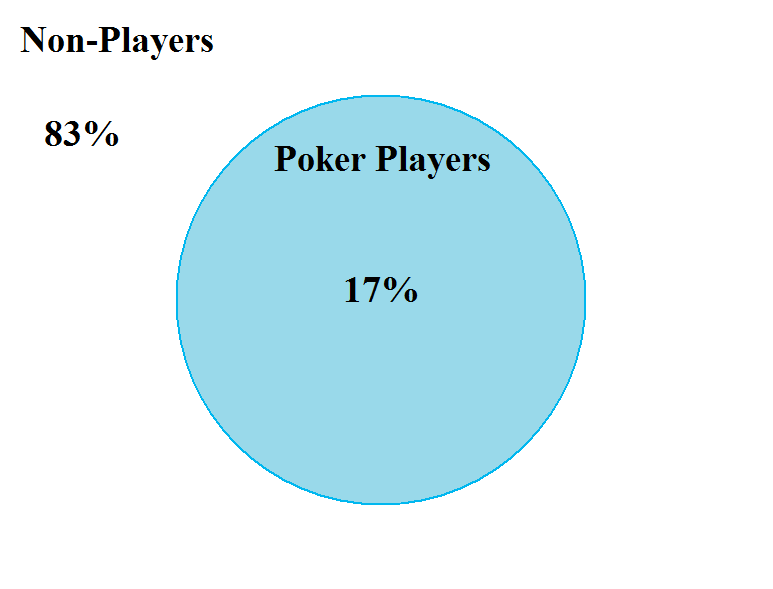 The result is that about 14% of poker players are gamblers, versus 5% of the population as a whole. Therefore poker players as a group become more identified with gambling than other groups, despite the fact that no actual aspect of the game of poker has contributed to these effects. Play with the numbers and the effects can be more drastic. 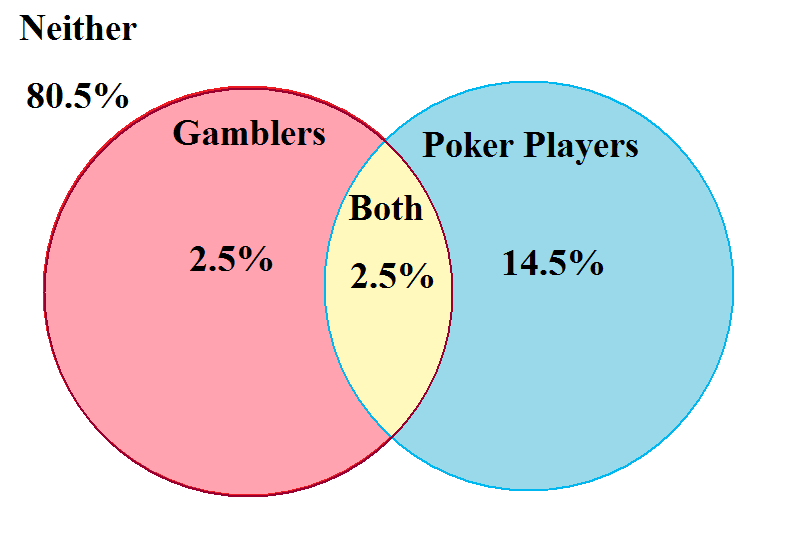 If you take a broader view of "gambling" and let the percentage of gamblers exceed the percentage of poker players, the percentage of poker players that are also gamblers can get as high as you want. We have seen in our analysis of the WSOP Main Event that high-stakes poker games demand either a high level of wealth or a high level of risk tolerance (or even risk-seeking-ness). Realistically, though, in the age of $100k-buyin tournaments and nosebleed cash games, the WSOP Main Event is pretty small. If we were to perform any sort of reasonable risk analysis on the highest-stakes games in the world, we'd find that tremendous levels of wealth are needed for a risk-averse individual to participate, and yet the general consensus is that very few players actually have a proper bankroll for these games. Among rational players who aren't millionaires to begin with and who manage their poker career like a long-term, low-risk investment, few of them will ever be able to climb all the way up through the stakes and reach the highest-stakes games. On the other hand, gamblers with the same skill sets as these rational players are likely to throw caution to the wind and move up too quickly, or impulsively play in stakes that are outright too high for them. Among this group, some of them will succeed and then maintain themselves at the higher stakes. Therefore, the highest-stakes games should have a significantly higher percentage of degenerate gamblers than the poker community as a whole. Finally, now that we've got our high-stakes players, the media will inevitably focus their attention on those players who produce the best stories. Gamblers (of various degrees) produce better stories than those who are more conservative with risk. Therefore we should expect an even higher percentage of the high-stakes players we hear about to have tendencies towards gambling than the high-stakes community as a whole. All told, as we restrict our attention to the biggest poker players, we might expect as many as half of them to also be gamblers. Their gambling activity, which is at best tangential to the game of poker, will not be representative of the world of poker. The most talked-about members of the poker community are an extremely small sample of the entire poker community, and we should expect this sample to also be strongly biased in favor of people who are predisposed to degenerate gambling. The vast majority of the members of the world of poker would never dream of ever making a wager as ridiculous as that of Griffin and Qureshi. Even among successful, competitive, professional poker players, I expect that few of them share the view of poker culture that these prop bettors have. Since this behavior is not characteristic of the vast majority of poker players, and since the behavior is completely unrelated to the game of poker (but probably related to a self-selecting subgroup of poker players), the culture of these crazy prop bets is a separate culture from that of poker. Stories such as these should be neither good nor bad for poker. Suggesting that stories such as these are somehow inherent to or representative of poker, however, is almost certainly bad for poker, as well as incorrect. Excellent commentary. Articles like this are great for poker.